This workshop was attended by 18 participants drawn from across the country and a full spectrum of institutional types. Below we present a synthesis of the most important points from the workshop, the lessons learned, and recommendations for future action. In addition, the workshop produced a set of web pages addressing common concerns or issues in teaching geoscience online as well as a collection of examples of courses and activities taught on line. We hope that these pages will help faculty who are engaged in teaching online as well as providing a starting point for those who are designing their first online courses. Online teaching is an important part of the portfolio of ways in which we provide geoscience education to undergraduates. Participants courses are full of alternative students including from those who have children or jobs that demand a different schedule; those who are in the military, working overseas, or traveling; those attending high school or college in settings that do not provide geoscience courses (or geoscience education courses); and those who prefer to interact with others via writing. This audience is large, important and growing. We neglect online teaching at our own peril and at the peril of a country that needs a geoscientifically literate population. Online teaching share many challenges with face-to-face teaching: motivating students, engaging students in inquiry-based activities including those that make use of observational data, online data, and quantitative reasoning, and accurately assessing students learning. As might be expected, many of the challenges that are unique to teaching online come from the fact that the instructor and the student are not in the same place and that communication is dominantly written, and interaction takes place asynchronously and is mediated through the internet. As a result, some traditional approaches to motivating, engaging and assessing students are not possible and others are more time-consuming for the instructor. Hybrid courses, an interesting middle ground where students meet both face-to-face and on line are of growing interest because they allow for more efficient scheduling of classroom space, support multiple learning styles, and introduce flexibility into both the student and faculty schedules. Hybrid courses can emerge naturally from increased out of class online communication with and among students. There is strong agreement that the up-front work of setting up an online course is formidable. On the other hand, online learning is particularly amenable to resource sharing and to distributed teaching -- that is multiple instructors at one or more institutions teaching sections of the same class or classes built upon the same materials. Online courses have many of the same scale factors as face-to-face courses. Student/faculty interaction is fundamentally limited by course size. In small courses, faculty can interact in rich ways with students, monitor their individual progress, provide detailed feedback on their work, and effectively manage discussions. In large classes, faculty must devise ways of efficiently managing students activities, provide less feedback and guidance, and use grading techniques that are scalable. Thus large online classes are less likely to have faculty actively managing discussion (discussion groups must be limited in size to be effective, thus large classes have to have multiple discussion groups); grading written work; or providing motivation to individual students to complete their work. Online teaching is providing an exciting career opportunity for many geoscience educators who desire flexibility in their professional life. communicating expectations using rubrics both for discussions and other assignments. Similarly, there are strong examples for adapting case study approaches, visualizations, and models for use on the web. There are also a number of interactive modules designed to guide students through exploration of geoscience ideas and materials that are very suitable and used effectively for online teaching. These have been developed by individual faculty, by publishers, and by funded educational research projects. Whole group discussion is a much larger part of online teaching than it is in its face-to-face counterpart. More than verbal discussion, online written discussion provides opportunities for students to compose thoughtful responses, and these responses can be graded. Because the discussion is asynchronous, all students have an opportunity to contribute and can be required to do so. We learned of examples where discussion can count for up to 50% of the final grade in an online class. Faculty teaching online find managing these discussions to be an insightful and rewarding, though time-consuming part of teaching online. In contrast, small group work, which is an important tool for promoting engagement in face to face classes is much less utilized in on-line classes. No one in our group had successfully implemented a small group activity. We offer an example of a jigsaw activity designed for online teaching as a mechanism for moving forward with experiments in this area. Similarly, online learning has emphasized asynchronous interactions. Exploration of models for synchronous interaction, particularly among small groups, may yield valuable new methodology for distance learning. Platforms for teaching online are numerous and range from commercially available course management systems or systems designed to incorporate best practices from educational research. At present there is much frustration with the course management systems available for teaching online. User interfaces tend to be clunky and tools are frequently inflexible. Faculty find robust tools for creating online materials and facilitating online interaction, however, it is very difficult to integrate these tools into the CMS. Faculty would like more facility for separating the course content from the course management. They would also like more materials to be freely available for educational use to facilitate sharing and avoid copyright issues. Plagiarism - similarly, students have numerous sources for obtaining material that can be copied and pasted into their assignments and passed off as their own work. In addition to issues of cheating, it appears that many students are unaware of the ethics surrounding writing and plagiarism. Grading effort - writing is the primary mechanism for communicating in an online course. Thus, grading at all levels from discussion to projects becomes grading writing. This is very time consuming under any circumstances, and is made more difficult because it can not be done using traditional pen and paper approaches. Faculty reported a number of strategies for speeding up grading without reducing quality or the personal nature of the response. However, as is true in face to face courses, the time burden of grading is a major issue in the scalability of online instruction. The challenge of keeping our students engaged and motivated is common across grade levels, subject matter, and all types of institutions and courses. Online courses, however, present a special concern. With students and faculty in contact only via the internet several new challenges arise. We have developed a resource to help others understand the nature of online learners, provide tips for designing engagement into your course and instructor behaviors that promote engagement, and summarize research on student engagement and its application to online teaching. Research has shown that online instruction, including hybrid courses that involve some face-to-face instruction coupled with online components, can be just as effective as traditional face-to-face courses in providing high-quality learning experiences. Recent advances in technology, coupled with changes in how today's students interact with technology, require that traditional face-to-face pedagogies that often rely on visual and auditory cues be modified if they are to be effective in the online environment. We have developed a resource that describes strategies and examples for engaging students both individually and through small groups. Teaching with data is one of the most exciting aspects of teaching geoscience: online and face-to-face. We have created a resource that addresses some of the unique challenges of online teaching with data including how to effectively convey instructions. We also provide a set of examples of exemplary online lessons using data. 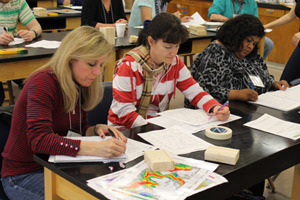 One of the biggest challenges to teaching geology online is the effective integration of lab activities. Two major hallmarks of most face-to-face labs that are not as easy to achieve in an online course are: 1. direct synchronous access to an instructor during the activity, and 2. access to materials such as hand samples, microscopes, etc. We have developed a resource that makes the argument for why labs should be incorporated in online teaching and provides suggestions and examples for how to develop labs. Many of those teaching online are isolated from a community of peers. Coupled with the observation that many of the challenges of teaching online are distinct to this medium, this suggests that additional opportunities for online geoscience educators to share and interact would be both welcome and fruitful. 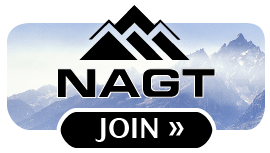 Workshop participants invite other online teachers to join our list-serv and contribute to this website. 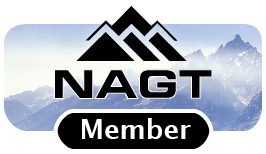 Further we suggest that NAGT, On the Cutting Edge and others continue to provide professional development opportunities and mechanisms for interaction among online geoscience educators. similarly, think carefully about how you will give instructions to students who are unable to see what you are doing or to ask questions in real time. manage your time - set limits, consider the time involved in pre-class preparation, discussion management, and assessment as you design your course. Remember that your course will grow and evolve over time and develop a long term strategy. make use of the materials developed by others - this is a great time to repurpose or reuse, but don't forget to cite your sources and credit those who work you are using. be proactive about developing a community of peers, learn from others' experiences and join our community. There are abundant materials that have either been developed for, are suitable for, or could easily be adapted for use in teaching geoscience online. The workshop has provided a good start in identifying and organizing these materials and opened participants eyes to all that is available. Further work identifying and organizing these materials would be highly valued because it would both reduce set up time in developing new courses and allow for better selection of appropriate high quality resources. Such a collection would allow us to identify areas in which new materials development is needed. Development of new online teaching materials requires geoscientific, educational and technical expertise. Team approaches to facilitating development similar to those used to create materials for teaching with online data would be beneficial. Being a participant in an online course is a valuable experience for an instructor. It is a great way to learn the challenges of time management and communication. Human resources are as important as online resources in preparing to teach an online course. We suggest that a mentoring network and robust bulletin board/email list be established. Faculty teaching online are particularly articulate about strategies for communicating expectations, motivating students, and engaging students because the online medium requires that these aspects of teaching be explicit. They may provide a powerful resource for faculty teaching traditional courses in these areas. Departments may wish to call on their expertise explicitly. Faculty teaching online tend to be part of a campus-wide community that transcends traditional departmental boundaries. They provide a useful link to activities beyond the department and integration into campus-wide activities. They may also have valuable interdisciplinary colleagues beyond the campus because of their involvement in the online teaching/distance learning community. Build bridge to regional GSA session participants and invite others who expressed interest to visit the website, join the listserv, and use the discussions. If interested submit abstracts for professional society meeting. Explore a short course on teaching on line for GSA - database use, sharing ideas, teaching online for the first time - Bill and Karin, Eliza, Eleanour. Continue to use the listserv/discussion board to mentor each other. Set up mentoring network for faculty who are new to online teaching. Work with Karin as she moves our collaborative work up to the live website.